This product has been discontinued on 10/1/16, and replaced by EnGen™ Cas9 NLS, S. pyogenes (NEB #M0646). 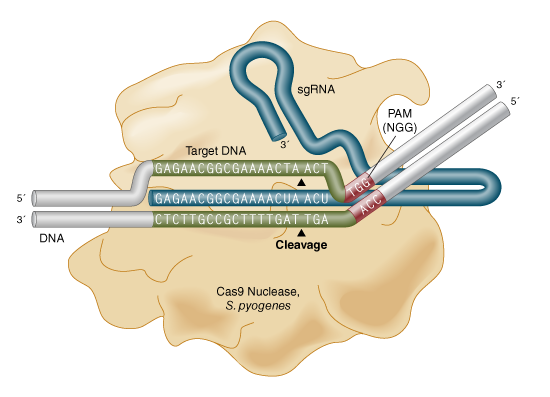 Cas9 Nuclease NLS, S. pyogenes, is an RNA-guided endonuclease that catalyzes site-specific cleavage of double stranded DNA. The location of the break is within the target sequence 3 bases from the NGG PAM (Protospacer Adjacent Motif) (1). The PAM sequence, NGG, must follow the targeted region on the opposite strand of the DNA with respect to the region complementary sgRNA sequence. Cas9 Nuclease NLS, S. pyogenes contains a single Simian virus 40 (SV40) T antigen nuclear localization sequence (NLS) on the C terminus of the protein. An E. coli strain that carries the cloned Cas9 gene from Streptococcus pyogenes with a C-terminal Simian virus 40 (SV40) nuclear localization signal (NLS) and a N-terminal 6XHis tag. 1,000 nM is equal to 160 ng/μl. Where is the nuclear localization signal on Cas9 NLS S. pyogenes located? Which nuclear localization signal is fused to Cas9?